There are days when you want a turkey sandwich because you’re trying to be healthy, and there are others when you just need a big, cheap helping of Americanized Chinese food. 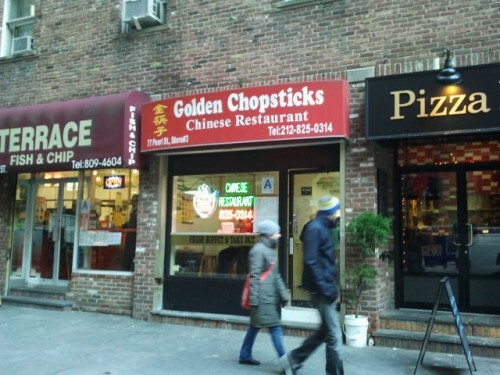 New Golden Chopsticks is one of the only remaining hole-in-the-wall Chinese spots in the Financial District that we haven’t written about. It’s nestled next to Terrace Fish & Chip off of Pearl St. and I can say it’s one of the better crappy Chinese food lunches I’ve had in a while, and I didn’t even get a gratis egg roll or watery cup of soup with it. Posted by Andrea H at 10:00 am, December 3rd, 2012 under Chinese, Financial District, Golden Chopsticks.